By William Mackay: IBF/WBA light welterweight champion Lamont Peterson (30-1-1, 15 KO’s) has reportedly accepted the latest offer made to him by Amir Khan (26-2, 18 KO’s) and his promoters at Golden Boy Promotions for a rematch on May 19th at the Mandalay Bay in Las Vegas, Nevada. Apparently, Peterson received an even bigger offer than the 50-50 purse split that was offered several weeks ago by Golden Boy and he went ahead and accepted the deal. It’s unknown at this time who the referee will be for the Khan-Peterson II fight. However, Khan had a lot of luck with Joe Cortez as his referee for the Marcos Maidana and that might be one that Khan would do well with in the Peterson rematch. In the Maidana fight, Khan was allowed to shove him at will and grab him around the head every time he got close to try and fight on the inside. Oddly enough, it was Maidana who ended up having a point taken off rather than Khan in the fight after Maidana elbowed referee Cortez after Khan climbed all over him. Peterson will beat Khan if a referee prevents Khan’s fouling techniques – shoving, pulling down on Peterson’s head, putting him in headlocks and holding & hitting. Peterson beat Khan by a 12 round split decision last December in a fight where Khan had tremendous problems with Peterson’s pressure on the inside in the last eight rounds of the fight. 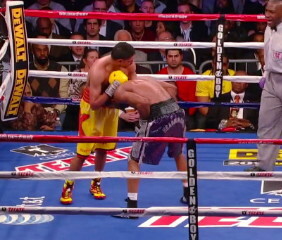 Khan didn’t adapt well to the inside pressure and started shoving Peterson early on. The shoving increased to the point where Khan lost a point in the 7th and the 12th. Khan knocked Peterson down with an elbow in the 1st round and was still given credit for it. He wanted to get credit for another knockdown, which occurred in the same round when Peterson clearly tripped over the leg of the referee Joe Cooper.